As 2018 comes to a close, we happily speak of a prosperous year in the Triad. More people, more businesses, more happenings. But you may have also noticed the rise in identity theft, malicious or outdated software, emergency situations and natural disasters. To support our growing infrastructure, we need a sturdy and safe foundation. With the holiday season around the corner – and people in high spirits – now is the time to be careful and prepared. For the past 16 years, John Thomas, Brad Ader, and Chris Bond have been supporting the Triad in growing, changing, and enhancing businesses across a spectrum of services. As the economy continues to grow so does the Ideacom and ITS footprint grow within North Carolina, South Carolina and Virginia. Ideacom and ITS know one thing for sure, communication is key to a business. Without communication and a secure network in place, stable growth cannot take hold. IDeACOM’s understanding of business needs and quick response rate has titled them #1 out of the 130 IDeACOM franchises nationwide. That title holds for the past five years! Now, housed under one roof with sister company Innovative Technology Solutions (ITS), Kernersville has the best technology solutions right at our doorstep. “Nowadays, as a business, you have to be careful because traditional phone vendors dabble in IT and vise versa. We provide a one-stop shop while maintaining true expertise. And I emphasize that we have guaranteed true expertise on both sides,” Chris Bond, co-owner of ITS explained. Both companies focus on total solutions, simply put, they figure out how to take business to the next level. From IT managed services, voice services, data cabling, camera surveillance, and more… IDeACOM and ITS create turnkey solutions tailored to every business. It certainly does not end there. “The real value is that we understand what our client’s business is trying to achieve and we use technology to give them a competitive edge. They are not just paying another expense, they are investing in tools and security to grow their business,” Chris pointed out. The goal is to align business needs with technology solutions…not only to simplify a company’s needs–but to save time, money, and headaches. 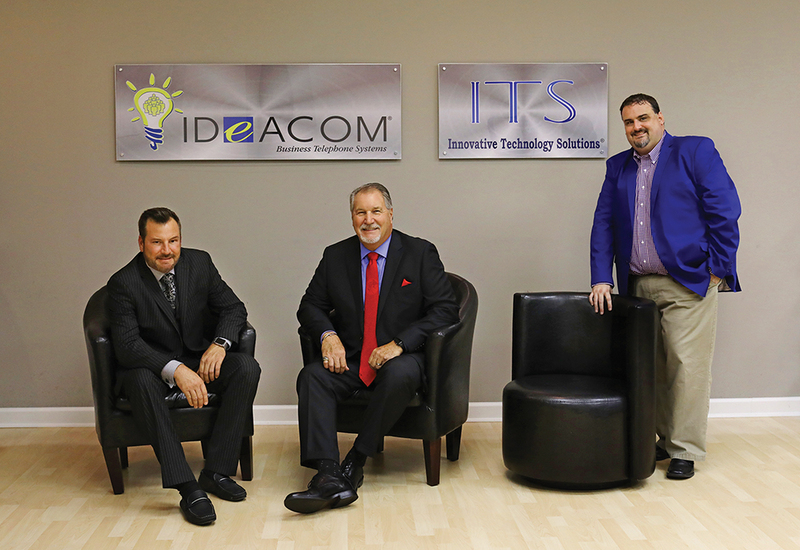 IDeACOM and ITS work together protecting and aiding companies as they grow. Many times, a simple service they have performed has saved their clients money right off the bat. A multi-state construction services company hired ITS to evaluate and make recommendations on how to improve overall IT. After an in-depth review, ITS created an action plan that included cloud managed network solutions, hosted Exchange platform for email, and delivered consistent hardware across all locations. ITS also renegotiated vendor contracts which saved the client around $20,000 annually. Whether needs are phone system solution’s, IT services, data protection, saving costs on phone lines, or evaluating internet bills, Chris, Brad, and John enable companies to be as efficient and productive as possible. If companies do not have executive level IT staff, IDeACOM and ITS uses technology business consulting – Virtual CIO – to figure out how to minimize costs and maximize profits. “We may find things that actually get in the way of business goals. So we set up long-term relationships and have real engagements where our team advises what to do or not to do,” Chris added. All the services offered enhance business intelligence, consolidate systems, and create better reporting and better decisions. Another new product is Staff Alerter. This can be used in schools, churches, offices–practically anywhere. It provides the best emergency notification service available. “Staff Alerter ensures any message for any person or group will be delivered regardless of the condition of facility power or network infrastructure. It provides a whole new level of safety that should not be overlooked,” John, co-owner of IDeACOM explained. All in all, the foundation of success is through stellar communication and using the best practices. If you run a business and do not have the technology and resources to ensure a smooth transaction, then it is likely you will slip behind. All it takes is one call to get your questions answered. Keep your business ahead of the game, so you can do your job and keep your customers happy. Phone and IT issues should never be something a businessperson has to worry about–leave it to the professionals. When it comes to products and services provided by the two companies, they cover all their bases. From installation to training to round the clock service, IDeACOM and ITS have a wide selection of services and products that can be found on their websites, IDeACOMNC.com and ITSofNC.com. Be prepared for the New Year and get off to a great start. Call 336.854.4455 for more information. IDeACOM and ITS are located at 1175-A South Park Drive, Kernersville.